The story of a French-Canadian textile worker named Phillippe Lemay is the story of thousands of Quebecois farmers who came to New England to work in the mills. They had no money, large families, little education, a strong work ethic and a deep attachment to the Roman Catholic Church. As soon as they stepped off the train in their homespun clothes, they were identified as ‘frogs,’ ‘Canucks’ and ‘pea soup eaters.’ The Irish especially disliked them – and that dislike turned into murder at least once. Phillippe Lemay survived it all. In late 1939 and early 1940, he told his story to Louis Pare, an interviewer with the Federal Writers Project for the Folklore Project. "The picture of one French Canadian textile worker and the picture of another are just as much alike as deux gouttes d'eau, or, as we have learned to say in English, like two peas in a pod,” Lemay said. Weaving room of an Amoskeag mill. Phillipe Lemay was born June 29, 1856, the fourth child in a family of 14 children, on a small farm in St. Ephrem d'Upton near Montreal. The farm couldn’t support the growing Lemay family, so when Phillippe was eight years old his father decided to take the family to Lowell, Mass., and look for work. The trip alone cost them nearly everything they had. The Lemays had to faire encan – auction off all their household goods -- to pay for railroad tickets, food and lodging. The wood-burning trains of the era moved slowly during the day, not at all at night. And so Phillippe Lemay’s family took four days to go from St. Ephrem d'Upton to Lowell. Today the trip takes about 4-1/2 hours by car. The Lemays arrived in Lowell with little more than the clothes on their backs and a new baby born during the journey. They joined 20 or so French-Canadian families in the city. But after the Civil War ended, many more French-Canadians moved to Lowell in a great wave of migration. Between 1840 and 1930, about 900,000 residents of Quebec moved to the United States. One-third of Quebec moved to New England to neighborhoods called Little Canadas. They were attracted to New England’s textile factories, which paid a living wage, albeit barely. But at least they earned enough to survive, which they couldn’t do back home. In the early years, French-Canadian textile workers earned 50 cents a day. Their board cost $2 a week, and they worked from 5 am to 8 pm with a half hour each for breakfast, lunch and dinner. Later, the mills shortened the workday from 6 am to 6 pm. Most French-Canadian textile workers didn't come to stay. They wanted to go back to their Canadian farms with the money earned in the mills. Some took leaves of absence from their jobs, perhaps a month in the spring to plow and plant their farm, another month in the fall to harvest. A friend or neighbor would tend the farm during the summer. Many feared becoming citizens. They couldn't speak English, a big handicap. They still paid taxes in Quebec and felt they couldn't pay taxes in the United States. In the end, about half the Quebecois – including Phllippe Lemay’s parents -- returned to Canada. As soon as he arrived in Lowell, eight-year-old Phillippe Lemay joined the ranks of French-Canadian textile workers. He went to work in Lawrence Mill No. 5 as a bagboy and doffer, replacing full bobbins with empty ones. His father, who worked in a saw mill, wanted him to go to school. But Phillippe saw that his parents needed every penny he could earn. His disobedience earned him frequent spankings. Doffer boys in a South Carolina textile mill, by Lewis Hine. Photo courtesy Library of Congress. “The only ones who had a chance to get an education were the youngest of the children, because older brothers and sisters worked in the mills, helping their parents,” Lemay explained. At first the newcomers from Quebec boarded with relatives. Then, when they could afford it, they rented tenements, usually owned by the company. The windows had no curtains, just paper shades that had to be rolled by hand. A braided rag rug covered the floor, scrubbed with lye once a week. Life revolved around the mill and the church. Priests commanded enormous respect. In French-Canadian Old Town, Maine, for example, a popular superstition claimed a priest could cure any disease if he wished to. Every night after dinner, but before the dishes were washed, the Lemay family prayed together and recited the rosary beads. Saturday nights they had fun during old-fashioned social gatherings in their homes, singing and square dancing. Phillippe Lemay remembered a fiddler who knew one tune and an accordionist who knew another, so they didn’t play together. Lowell’s large Irish community feared the French had come to take their jobs. The Irish began a campaign of petty persecution. Irish boys put dirt in French children’s pails when they tried to get water from the public pumps. They stuck French worshippers with needles and pins during Mass, so much so that the French began to stay home. Phillippe Lemay’s father worked outside at night, when Irish boys threw rocks at him. The Amoskeag Millyard in Manchester, N.H. 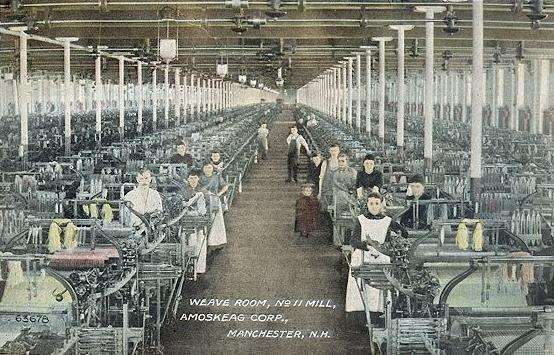 In 1872, when Phillippe was 16, the Lemays moved to Manchester, where the giant Amoskeag mills offered plenty of employment to French-Canadian textile workers. But they fared no better with the Irish. Before the first French church was built in 1873, the French had to walk through the Irish neighborhood to attend Mass. Irish boys threw swill at them, beat them with sticks and threw rocks. 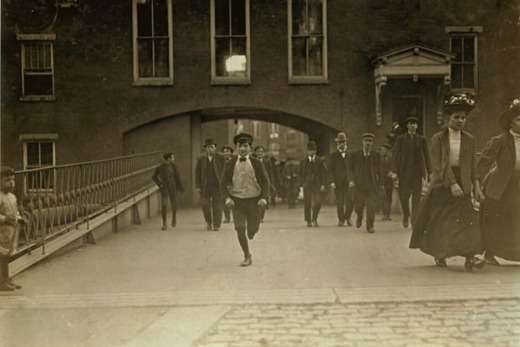 Boy leaving work at Amoskeag Mills, Manchester, N.H. The completion of that first French church, St. Augustine, caused an immediate increase in French immigration from Quebec. Five or six families arrived every day on the train from Canada. The French Canadians began to open businesses -- bakeries, beer parlors and grocery stores. They built a rectory for their pastor, then a school for French children, then a cemetery. They started to form fraternal organizations like the St. Jean Baptiste Society and to publish their own French-language newspapers. A marching band called the Fanfare Canadienne started at St. Augustine Church. Made up of French-Canadian textile workers, it played popular tunes for fraternal organizations. One night in 1880, a 23-year-old band member named Jean Blanchette was talking in French with several bandmates near Victory Park in downtown Manchester. Three intoxicated Irishmen came out of a beer parlor and heard the French spoken. They attacked the French-Canadian textile workers, who fought back. One of the Irishmen fell on a bottle of hard liquor in his pocket, and it broke. He threw the broken bottle at Jean Blanchette, severing his jugular vein. Blanchette died 20 minutes later. A thousand people marched in his funeral procession through the streets of Manchester, which were lined with French onlookers. Sixty years later, Phillippe Lemay said the French-Canadian textile workers didn’t exact revenge from the Irish who killed their friend. Blanchette’s assailant went to prison for five years and died shortly after his release. 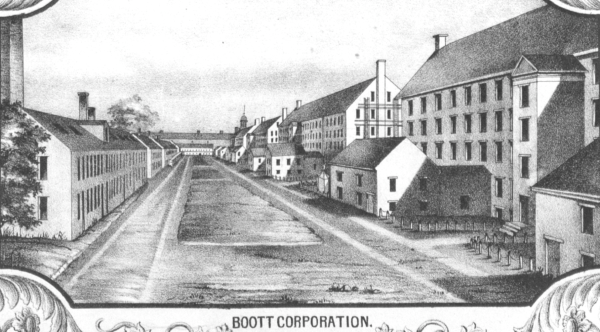 Lemay worked hard at his trade and rose through the mill’s ranks. In 1901, he asked for a promotion as an overseer of a spinning mill. His request shocked his superintendent. “What! A Frenchman had the crust to think he could be an overseer!” recalled Lemay. He got the promotion to the dismay of the American and Irish workers, who stopped talking to him. Eventually more French-Canadian textile workers got promotions to management positions. By 1906, Manchester had a French-Canadian bishop and in 1918, the first of many French-Canadian mayors. French-Canadians became distinguished doctors, lawyers, teachers, artists, architects and bankers. "To what do we owe our success?” said Phillippe Lemay. I believe we owe it to the self-sacrificing French Canadian immigrants from old Quebec, to the courage that made them refuse to accept defeat and quit when that would have seemed the natural thing to do; to the cheerfulness that carried us through our trials and tribulation and helps us old-timers to wait happily for the final bell calling us home to rest after our long, hard life in the textile mills. And perhaps the bloody death of Jean-Baptiste Blanchette, a martyr in the true sense of the word, had its share in bringing about the conditions we are enjoying today. 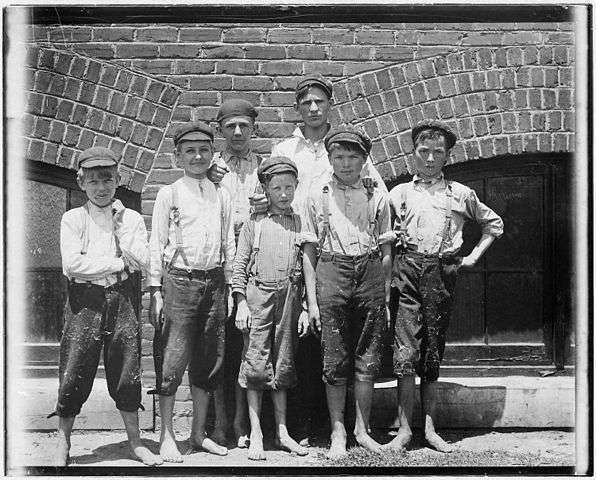 If you enjoyed this story, you may also like to read about Lewis Hine, the photographer who exposed child labor, here. My family came to Leominster from New Brunswick province. They came looking for work.They all but one brother remained in the United States.